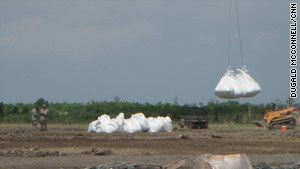 The National Guard lifts sandbags in Buras, Louisiana, on June 11 to fill in gaps between barrier islands. Scofield Island, Louisiana (CNN) -- There's a constant thunder of helicopters this weekend around Scofield Island and Pelican Island on the Louisiana coast. Blackhawks and Chinooks from the Louisiana National Guard are dropping giant sandbags into the gaps between barrier islands, in an effort to keep out some of the oil from the BP spill. On each run, the choppers pick up a few 1,500-pound sandbags from an airfield on the mainland, where rows and rows of white bags stand ready. As the pilots hover just six feet off the ground, soldiers dart underneath to hook cables onto the aircraft's bellies, sometimes having to jump to get the sling over the hook. "You fight to stand up, with this steel ring in your hand," says Lt. James Gabler of the Louisiana National Guard. "The wind is just constantly beating on your chest, pushing the air out." Once the bags are hooked, the soldiers sprint clear, like they are fleeing the scene of a crime and soon it's clear why. Video: Is the beach safe? When the helicopter pulls up, hoisting all that weight, it is simply impossible to stand upright underneath it. The rotor wash blows away anything that is not tied down and kicks up a storm of blinding sand and stinging debris. A journalist's camera lens gets coated with dreck. Earplugs are a must. Dangling from the cables, the sandbags are flown seven miles to the drop zone. As the chopper comes in low and aims for the drop zone, spray flies up in all directions. The target is a channel between two sandbars that the engineers want to close off. The bags splash down in the shallow water, and the aircraft jumps up when all that weight is released, as if a spring had been released. About 800 sandbags per day are being airlifted in this costly effort, by a fleet of around ten helicopters making runs all day. After more than a month of work, the 843rd Engineering Battalion has filled in the gaps on a two-mile stretch of these islands and has ten more miles to go. Louisiana Gov. Bobby Jindal, visiting the operation Friday, told CNN it was a long-term effort against a threat that will stretch for months. "I would much rather fight the oil out here against these bags, against this sand than have it get past here, get into those fragile wetlands, where you have got the oysters, the shrimp, the fish, the crabs and the birds," he said. Seen close up, each bag is the size of a refrigerator. But seen from the air, the thin lines of white look like no match for the wide channels between the sand bars. "These bags alone won't save our coast," Jindal admits. "But these bags, along with the Hesco baskets, the tiger dams, the sand dredging, the barges, the rocks -- we're doing all of that to protect miles of our coast." Gabler said he and his 40 men are grateful to have a job that might be able to save some of the shoreline from the spreading oil. "As a native here, it makes a real difference on my heart that I'm able to be here and help," he said.